Authors: Novikov V.A., Umnov V.V., Zvozil A.V. Objectives. The objective of study was to assess the effectiveness of transplantation of m. flexor carpi ulnaris tendon on the place of m. extensor carpi radialis brevis / longus (Green operation) to eliminate the deficit of active wrist joint extension in children with cerebral palsy. Materials and methods. The present study is based on a survey of children with cerebral palsy with affected upper limb. The main criterion for selection of patients was the presence of active extension deficit in the wrist joint, both isolated and in combination with other contractures of the upper limb joints. Total 22 patients with spastic forms of cerebral palsy were examined. Results and conclusions. Green operation is a good method of surgical treatment of active extension deficit in the wrist joint in patients with cerebral palsy. In the presence of moderately severe contractures in the wrist joint, serial casting can eliminate them completely. Presence of a fixed pronation contracture of the forearm is a factor that reduces the effectiveness of FCU transplantation. Pronation contracture should be corrected before or during Green surgery. FCU transplantation is effective for children of any age, but its effectiveness is reduced from 12 years old. cerebral palsy, upper limb, spastic hand, active extension deficit of hand, surgical treatment, Green operation. Бадалян Л. О. Детская неврология / Л.О. Бадалян. М.: Медпресс-информ, 2001. 607 с.
Капанджи А. И. Верхняя конечность. Физиология суставов / А. И. Капанджи. М.:Эксмо, 2009. 351 с.
Мирзоева И. И. Хирургическое лечение пронационно-сгибательных контрактур предплечья и кисти у больных с детским церебральным параличом / И.И. Мирзоева, А.М. Ненько. Л., 1980. Ненько А. М. Хирургическое лечение контрактур и деформаций верхней конечности у детей с церебральными параличами / А. М. Ненько. СПб., 1992. Семенова К. А. Восстановительное лечение больных с резидуальной стадией детского церебрального паралича. К. А. Семенова. М.: «Антидор», 1999. 384 с. Beach W.R. Use of the Green transfer in treatment of patients with spastic cerebral palsy: 17-year experience / W.R. Beach, W.B. Strecker, J. Coe, P.R. Manske, P.L. Schoenecker, L. Dailey, J. Shriners. Pediatr. Orthop. 1991. Vol. 11(6). P. 731-737. Green W.T. Tendon transplantation of the flexor carpi ulnaris for pronation-flexion deformity of the wrist / W.T. Green. Surg. Gynecol. Obstet. 1942. Vol. 75. P. 337-379. Miller F. Cerebral palsy. N.Y., 2005. P. 387-432. Ozkan T. Tendon transfers for the upper extremity in cerebral palsy / T. Ozkan, S. Tunçer. Acta. Orthop. Traumatol. Turc. 2009. Vol. 43. P. 135-183. Roth J.H. Functional outcome of upper limb tendon transfers performed in children with spastic hemiplegia / J.H. Roth, S.E. O'Grady, R.S. Richards, A.M. Porte. J. Hand. Surg. Br. 1993. Vol. 18. P. 299-303. Van Heest A.E. The supination effect of tendon transfer of the flexor carpi ulnaris to the Extensor carpi radialis brevis or longus: a cadaver study / A.E. Van Heest, N.S. Murthy, M.R. Sathy, F.A. Wentorf. J. Hand. Surg. 1999. Vol. 24(5). P. 1091-6. Winner S.M. Transfer of the flexor carpi ulnaris to the radial wrist extensors in cerebral palsy / S.M. Winner, K.A. Johnson. J. Hand. Surg. 1988. Vol. 13(2). P. 231-3. Yildizgören M.T. Effects of Neuromuscular Electrical Stimulation on the Wrist and Finger Flexor Spasticity and Hand Functions in Cerebral Palsy / M.T. Yildizgören, G.F. Nakipoglu Yüzer, Т. Ekiz, N. Ozgirgin. Pediatr. Neurol. 2014. Vol. 50(5). P. 285-9. 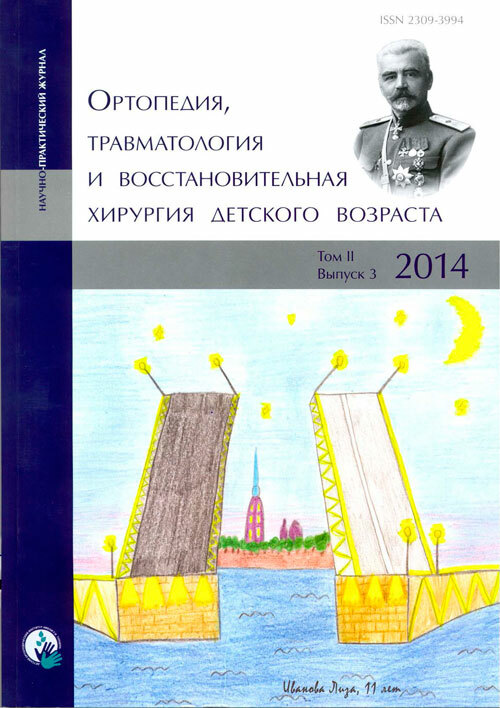 Copyright (c) 2014 Novikov V.A., Umnov V.V., Zvozil A.V.